Kinetic KTS164xQ Automotive Load Switches, available now from Mouser, provide low-resistance and enhanced protection features from an abnormal power supply or load problems. The device runs from a wide input supply voltage of 6V to 40V, guarding the system against reverse input supplies down to -28V. 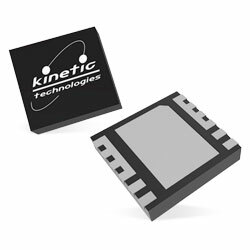 The device combines two N-Channel MOSFETs and comprises fixed over-voltage protection of 27V (KTS1640Q) or 20.3V (KTS1641Q) along with over-temperature protection with auto-retry. The device will continue operation automatically once the over-voltage condition is removed. An ENABLE pin allows the MOSFET switch to be enabled or disabled and allows the device to be placed in a low current shutdown mode. System monitoring is provided by a fault FLAG. Protection features incorporate over-temperature shutdown, battery detection output, and auto-retry. The devices are packaged in an advanced, fully green compliant, TDFN44-12 package. Typical applications include automotive load switching, reverse power supply protection, telecom/server/networking system, industrial and medical systems, and portable instrumentation.